40,000gns yearling trained by AJ Perrett winning eight races from 7f to 9f at 3yo to 4yo. Ran three times at 2yo placed third on 7f debut Sept 6th then unplaced in late season maidens over 7f and 8f. Won four races at 3yo with two late season Listed race wins at best. Improved further to win two French Group 1s at 4yo and an 8f Group 2 in Britain. 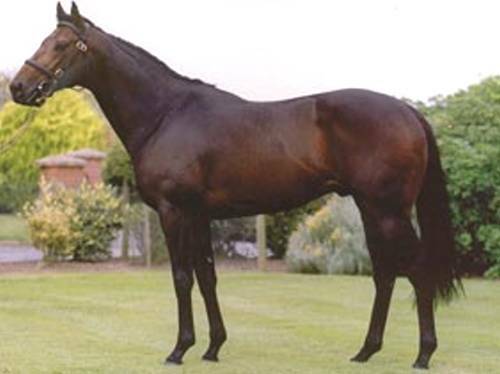 To stud in 2001 in Ireland & shuttles to Chile and below average results with two Group 3 winners in Chile at best. Moderate record with British raced 2yos and 5 winners from 34 runners in 2004-5 and the wins mostly at a moderate level. Has got winners at all distances from 5f to 8f. 18 yearlings sold in 2005 for an average around 8,000gns. No winner from 6 runners in 2006 and 5 yearlings sold for an average above 3,000 guineas. FORT HULL 1 Sep 10 FOLK 7 GF 5 M 50 13-13 0 . FORT HULL 2 Oct 3 SALS 8 GS 4 M 100 6-16 24 . FORT HULL 3 Oct 14 GDWD 9 SGS 5 M 22 9-13 0 .